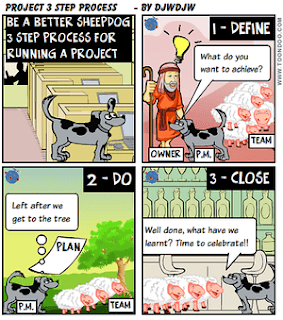 The purpose of these Training Modules is to guide you through the Be a Better Sheepdog site in a logical sequence to help you to become a better Project Manager whether you are new to the role or wish to improve on your performance. This is Module 1 of 8 of and provides an Overview of the training and some basic concepts; see other modules at the bottom of the page. You should understand some high level basics about Projects before delving into the detail. 1) A Project is a temporary venture with a start and an end using a temporary organisational structure to achieve an agreed objective within an defined timescale. Well, that's my description anyway, there are many others - here is the PRINCE2 one "a management environment that is created for the purpose of delivering one or more business products according to a specified Business Case". 2) Project Management is all about how we manage this temporary venture and is common to all types of Projects whatever the "technical" activities required (anything which isn't related to the management is often named "technical"). 3) A Methodology for Project Management is a useful thing to have as it provides a framework and common language which has shown to help achieve success. I am most familiar with PRINCE2 but there is also APM. But beware, I believe there are gaps in these methodologies such as what I call the "human side" of dealing with people and the behavioural characteristics to have or develop to be a successful Project Manager. Have a read of this post for more on this topic. 5) There may be other (technical) processes specific to the Project in question which you need to weave into the Project plan. An example from the world of IT is the waterfall development process consisting of various "phases" of activities such as Analysis, Design, Develop, Test, Implement. The principle is that you complete a phase before falling over the waterfall into the next phase. Module 2 - PM SKILLS - what skills and behavioural characteristics you need to develop to be a successful Project Manager?